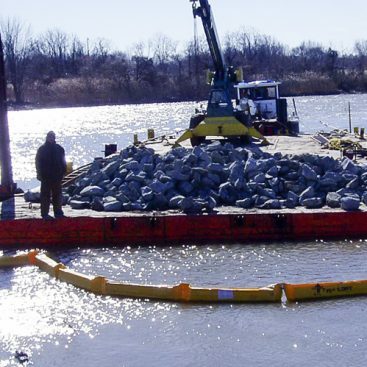 Geo-Con was contracted by Earthmark Mitigation LLC., to perform two contracts in the existing Richard P. Kane Natural Area located in the Moonachie, New Jersey area of the Meadowlands District. Both contracts are Wetlands Mitigation Banks, wetlands construction or restoration projects completed and sold as “credits” to offset impacts to existing wetlands. The credits from the Kane Bank are reserved for transportation-related impacts by four New Jersey State transportation agencies. The first contract was for a small 20-acre parcel developed as, now locally rare, “freshwater” wetlands. Invasive phragmites were eradicated, and the parcel was disked and planted with native trees and plants that will thrive in the low-lying area. Excavation of 115,000 Cubic Yards (CY) of tidal channel, which will tie into the adjacent, tidally influenced, Hackensack River. Creation of 7,114 Lineal Feet (LF) of flood control berm. 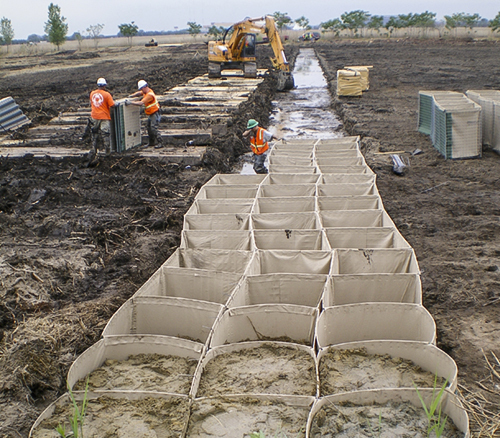 The berm is being constructed of soil-filled Concertainer® bastions manufactured by Hesco USA. The berm will protect adjacent properties from daily tidal flooding as well as major storm events. It is the first of this design-type to be performed in the Meadowlands. Because the site is composed of predominantly low-lying, hydric soils, excavation and grading cannot be completed by traditional earth-moving equipment. 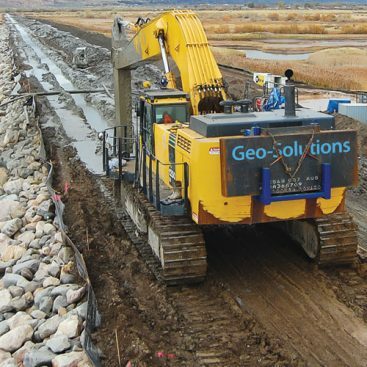 All equipment on site is ultra-low ground pressure, specifically designed for marsh work. Long reach excavators operating from timber mats are used exclusively for excavation and grading. 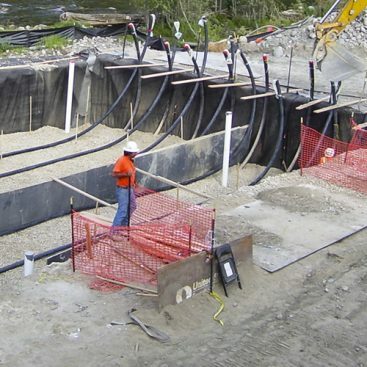 Installation of a streambed plug to separate an existing freshwater stream from its confluence with a second stream that will have its tidal influence restored upon completion of the project. Excavation of mercury impacted soils from the existing creek bed transecting the site. Impacted soils were transported to an on-site stockpile area where they were stabilized with a solidifying reagent and transported off site for disposal. Installation of bridges and trash racks over new channels. A Transco Pipeline and access road bisect the site; the bridges will allow Transco to maintain access to the pipeline through the site.